I must apologise for being a little slow on the posts this week. I'm just having a complete mental blockage and just can't get the words flowing like usual! Even the posts I have managed to do don't seem up to my normal standard... Hopefully I'll snap back in to it soon because it's difficult to write everyday when you can't think. 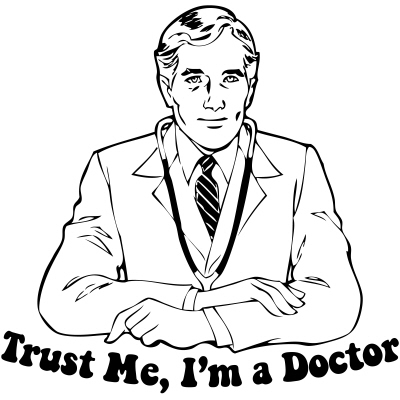 Today I want to write about something that our doctors have taught us or something we have taught a doctor. Now, I can't say there has ever been a time when I've specifically taught a doctor something about my endometriosis, but it's more the response you get when you ask or suggest something. A blank expression and a "no, that's nothing to do with your endometriosis". Since my initial diagnosis, it's become more and more shocking how little doctors actually know about the disease. I almost feel like I need to tell them exactly what endometriosis is sometimes. I remember one time, a while after I'd been diagnosed, I went to the doctor because I experiencing really bad shoulder pain every month around the time of my period. I didn't know what it was, but I did know it played up when I was bleeding so I asked the doctor if it had anything to do with my endometriosis. He almost laughed at me - seriously. I mentioned it to my specialist when I next saw him and he told me that yes, it is due to my endometriosis. Shoulder pain is an indication that you have endometriosis on your diaphragm - which was confirmed in my latest laparoscopy this year. If I had listened to my doctor then I would never have mentioned it again. At this stage, I'm now quite used to it and quite clued up on endometriosis and my options with it, but if you're not in the same position as me then you might not get the information you need because the doctors are not offering it. What then!? Have any of you ever had any experiences with this same thing? Oh, I've had experiences of this. I once asked my doctor to explain why my tummy was always so inflamed and sore because of endometriosis, it's swollen and painful a large part of the time. I've now learned that many women with endo experience exactly the same thing. I also have right shoulder pain with my periods, and it wasn't until I read up more on endo that I connected it. My GYN was also surprised. Now, I didn't connect them because I didn't go to med school. My GYN, however, had no excuse. The last GYN I went to told me endometriosis is just "uncomfortable." I looked right at him and said, "No. It is excruciating pain. Not 'uncomfortable.' Not being able to walk. Not being able to move. Bleeding excessively. Having organs fused together. These are not simply 'uncomfortable.' Uncomfortable does not affect quality of life. Endometriosis is chronic pain." He was a male GYN, so maybe he didn't understand completely how it affects women. So I also told him to imagine someone kicking him in the balls every ten minutes for three days straight. Totally uncomfortable? Or totally painful? Insensitive GYNs are bad, but stupid ones are the worst.